Having been foolish enough to have committed my player and team predictions for the recently departed (regular) baseball season to a couple of blog-posts several months ago, I find I have little choice but to go back and analyze my, uhm, analysis. Let’s start with my team predictions. As a Mets fan, I was not optimistic going into this season. I wrote an entire blog-post about why I thought Jason Bay was a bad signing. Turns out I was wrong about Bay. He wasn’t just bad. He was horrible. Meanwhile, I predicted the Mets would win somewhere between 78-84 games, probably coming in right around .500. Allowing Oliver Perez to pitch the Mets to disaster on the last day of the Mets season, the Mets lost to Washington 2-1, thereby securing a 79-win campaign. Oddly, I had predicted the Mets to finish in a third-place tie with the Marlins. The Marlins actually won just one more game than the Mets, so I feel vindicated. Staying in the N.L. East, I picked the Phils to win and the Braves to earn the Wild Card. Good for me! The Nats, of course, were predicted to come in last. 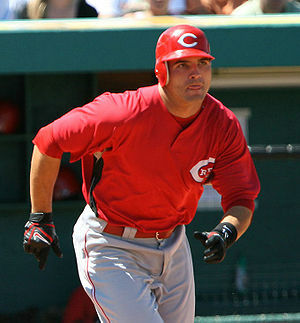 Joey Votto – Don’t bother reminding me about his anxiety problems. This year, the only people who will experience anxiety problems will be the pitchers who have to face him. 26-year old pure hitter in a nice hitter’s park. For some reason, I picked the Brewers to finish in second place. They actually finished third. But that’s not saying much in this sorry division. I had the Cubs, Houston and the Pirates finishing in 4th, 5th and 6th. The Astros actually finished just a game ahead of the Cubs, so…not bad. In the N.L. West, my picks were terrible. I predicted the Padres would finish in last place, the Giants in fourth place, and Arizona in third place. And I thought the Dodgers would finish second to the Rockies. I really like the Rockies. Their pitching staff might be the most underrated in baseball, and in Tulowitzki and Carlos Gonzalez, they have two of the most exciting young players in the league. Plus their terrific second-half last year should carry over into this season. Well, I stand by my characterization of Tulo and Gonzalez being two of the most exciting players in the league. If Tulowitzki didn’t miss a significant part of the season due to injury, I still think this was the team to beat. But I have no excuse for the rest of my picks in that strange division. Let’s take the players first. From the A.L. East (which I predicted Boston to win), I said this about second baseman Dustin Pedroia: This 26-year old has already won an MVP award, and offers a nice power / speed combination. Scores bushels of runs, and plays in a great hitter’s park. What’s not to like? There is no downside here. I also predicted that Boston’s first baseman Kevin Youkilis and outfielder Jacoby Ellsbury would have nice seasons, and that Mike Cameron would prove to be a valuable pickup. Those four key players combined to miss an astounding total of 405 games. Yes, the Yankees had their share of injuries. But no team in baseball saw so much potential run production vanish so quickly and for so long. Considering that the Red Sox still managed to win 89 games and finish just six games behind the second place Yankees, I still think the Bo-Sox could have, at the very least, won the Wild Card if their injury caseload had been more manageable. First ballot Hall of Famer will see at least a 20% decline in his overall offensive output from last season, but still has enough to offer at age 35. Will be drafted too early in most leagues due to rep and weak position. [He is] The 31-year old Latin Dave Kingman. Steer clear. Pena’s final line: 28-84-.196 Very Kingmanesque. Pointlessly, I picked Baltimore to finish ahead of Toronto. Baltimore ended up being even worse than I imagined. I thought losing Roy Halladay would signal the death-knell to this Toronto team, but they overcame his loss pretty well, finishing with an impressive record of 85-77. I keep reading about the Twins killer offense, but Cuddyer and Kubel should, in fact, be a platoon tandem, since one primarily kills lefties and the other can’t hit them at all. Morneau either gets injured, or slumps badly in the second half. It becomes the Joe Mauer show, but one man can’t do it all. And Joe Nathan being done for the year won’t help. Nowhere did I see DH Jim Thome rescuing the team about mid-season, when, as I predicted, Justin Morneau got injured. And the acquisition of Matt Capps to close games was also an unforseeable stroke of genius. Picking the Royals and Indians to finish at the bottom was, of course, a no-brainer. Many people still pick Angels to win West. This is a lazy pick. These are not the Angels of the past few seasons. Ervin Santana is your ace? He may win a dozen games. Too many defections to recover from. Texas’ pitching will also regress some from last year, and they’ll have their usual assortment of injuries. Heck, Ian Kinsler is already hurt again. It was Texas’ pitching that I was most wrong about, although interestingly, their “ace” of 2009, Scott Feldman, did have a poor season in ’10. He finished with a record of 7-11 with a 5.48 ERA a year after winning 17 games and posting an ERA south of 4.00. Although he is only 27-years old, he has already had his career season. His 17 wins last year, despite just 113 K’s in 190 innings, were a fluke. Yes, he did have a nice WHIP, but look for that .250 batting average against to go up around 20-30 percentage points this year. And, as we all know, wins are primarily a reflection of the quality of the team for whom you pitch. But I did not foresee C.J. Wilson, Tommy Hunter and Colby Lewis finishing with a combined record of 40-25, and all three with ERA’s below 4.00. As for other players that I liked going into 2010, I was optimistic about Twins starter Francisco Liriano, Padres starter Matt Latos, Brave second baseman Martin Prado, and outfielders Andrew McCutchen (Pirates) and outfielder Justin Upton (Arizona.) Four of the five had very nice seasons. Upton was disappointing, but still managed 17 homers and 18 steals in his age-23 season. Last years numbers, 5-13 with a 5.80 ERA and a WHIP of 1.55 will scare away most fantasy managers. But there are four reasons for optimism going into this season: 1. He is still just 26-years old, and will be another year removed from his elbow operation. 2. His strikeout rate last year remained pretty high despite his problems 3. The new ballpark in Minnesota should play to his strengths 4. He dominated in the Winter League. Could pay big dividends this season. In fact, Liriano improved to a solid 14-10 with a 3.62 ERA in 192 innings, striking out 201 batters. Latos also finished with a 14-10 record for the punchless Padres with an excellent ERA of 2.92 in 185 innings, striking out 189 batters. And on an awful Pirates team (57-105), McCutchen scored 94 runs, stole 33 bases, hit .284, slugged 16 home runs and 35 doubles, and drew 70 walks. According to Baseball-Reference.com, the two players whose career profiles Cabrera’s is most similar to are Ken Griffey, Jr. and Hank Aaron. Has a .925 career OPS in six full seasons. Turns 27 in April. The A.L. player most likely to win a Triple Crown. Cabrera had a fantastic season: 38 homers, 128 RBI, 111 runs scored, a 1.042 OPS, and a .328 batting average. As for the Triple Crown categories, he led the A.L. in RBI, finished second in batting average, and Blue Jays outfielder Jose Bautista’s It-Came-Out-Of-The-Sky home run total of 54 pushed Cabrera’s home run total down to third place, just one behind runner-up Paul Konerko. In other words, if you remove Bautista’s outlier season from the mix, Cabrera comes damn close to winning the A.L. Triple Crown. I think I got the pitching right. Tulo got hurt, but had a huge September, at one point hitting 14 home runs in 15 games. Mauer’s power disappeared, but he still hit .327 on a first-place Twins team. Heyward might win the ROY award, though personally I’d give it to Buster Posey of the Giants. Matusz was simply a case of expecting too much too soon from a pitcher who still displayed promise on a very bad Orioles team. BTW, I predicted that the Phillies would lose to Boston in the World Series. I still think the Phils will go to the W.S., but now I think they will beat whomever they face. Halladay, Hamels, and Oswalt is just too deep a rotation to have to face. So there, I’ve done it again. Now I have yet another inadvisable prediction to explain away in about a month. So be it. Later this week, I will resume my series, “Best Forgotten Baseball Seasons” with a look at the Chicago White Sox. On a final note, an essay of mine, “Opening Day 1977: A Swan Song for the Mets,” has just been published in a collection of stories called “Tales From Opening Day,” published online at Baseballisms.com. Check it out. It’s free!